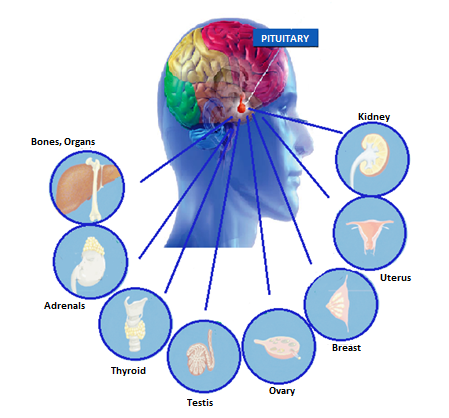 Pituitary is an endocrine gland located at the base of the brain. Together with the hypothalamus, they control all peripheral endocrine glands function, such as the thyroid, the gonads (testicles and ovaries), the adrenals and also metabolism, fluid balance, onset of childbirth and development in children. Adenomas represent the most frequent pituitary disorders, counting for 75% of intracranial tumors, in total. A 75% of all adenomas remain functional, i.e. they produce one or more hormones while a 25% are non-functional and do not produce any hormones. Adenomas may cause pituitary functioning disorders, partial or full deficiency, overproduction of one or more hormones and neurological symptoms. Consequently, the patient may present a variety of symptoms such as galactorrhoea, increased limb size (palms and feet), tongue, lips and soft tissue hypertrophy, increased sweating, diabetes mellitus, hypertension, central obesity, thin skin that gets easily bruised, abdominal purple or red striae, menstrual disorders, infertility, very tall stature in children – gigantism, diplopia, and headaches. Based on the clinical examination, the endocrinologist can detect the hormonal disorder and proceed to the appropriate laboratory and imaging control that will set the final diagnosis and help determine the treatment.